I hope everyone had a Merry Christmas, and if you've taken some time off this holiday season, be sure to give this a read. 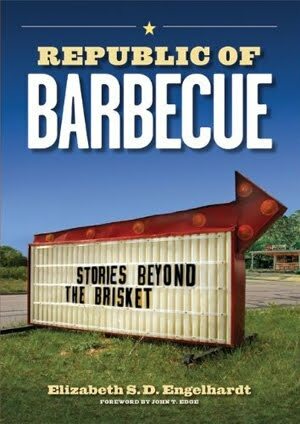 There is no collection of Texas barbecue stories more in depth or diverse than what is between the covers of Republic of Barbecue. The book is written by some Austinites, so don't be surprised when the subject matter ventures into social and racial discussions as well as feminism's role in BBQ, but when the book focuses on the 'cue, the stories are great. In collecting the stories for the book, this group of UT students (in conjunction with the Southern Foodways Alliance) ate their way through Central Texas to find the essence of barbecue in Texas. Much of this collection's focus is on the tradition of Texas BBQ. Whether it's in the form of an essay trying to define tradition, or stories from some of the old timers who helped form the traditions like Bobby Mueller (Louie Mueller Barbecue), Vencil Mares (Taylor Cafe) and Richard Lopez (Gonzales Food Market), you'll know the difference between the old time smokers and the new fangled gas-fired rotisseries by the time you finish the book. The subtitle, "Stories Beyond the Brisket" is evidenced in some often ignored links in the BBQ chain like commercial sausage manufacturers, wood suppliers and beef producers. Their stories really enlighten the casual BBQ fan of all that's involved in getting that smoked brisket to their plastic tray. If it's coverage of Dallas or El Paso you're seeking then you'll be out of luck. This book features only stories from Central Texas, but if this book is any indication on what would come of statewide expansion, let's hope this group branches out to document the rest of Texas.